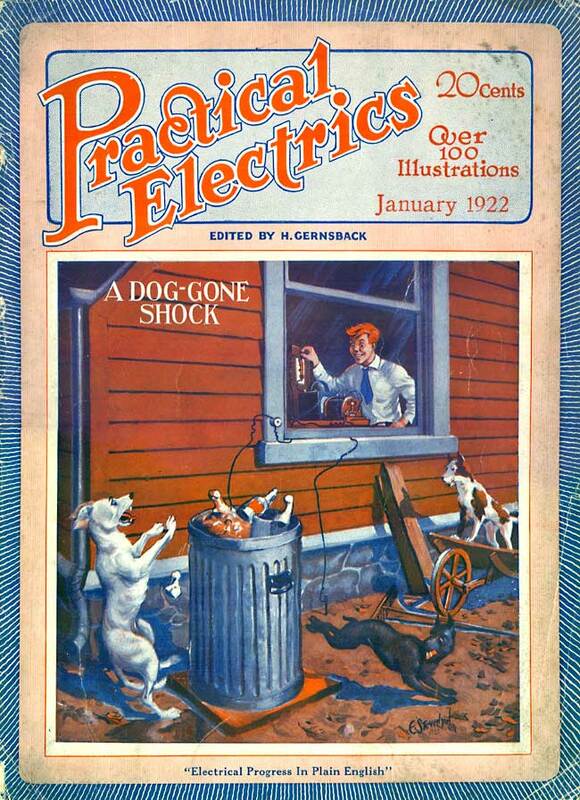 A Dog-Gone Shock electric trash can deterrent for dogs. From Hugo Gernsback's Practical Electrics magazine, January 1922. Put your kid in a tie, and let him get his jollies being mean to critters trying to get enough to eat. He probably went on to become a corporate CEO! I would think that at that time 20 cents would have been a lot of money but with inflation as a guide it only is equivilent to about $3 today=a cheap mag. However a 10c bag of lollies(candy) in early 60's costs about $5 today. So inflation calculators can't be used in many situations. Stats are/can be interesting and don't allow or count for Fads & supply & demand. A quality vinyl record in 70's was $5.95 to $6.95 & a CD in 1980 was around $28. My Sony CDP101 cd player was $1500 in 1980 but it was a class above even dearer units. Trash can lids were not available in 1922? It's weird how he puts on a tie before shocking the neighborhood dogs. And that look in his eyes. Can't imagine such a thing being published today. Closest thing might be people electrifying the political signs on their lawn, so thieves get shocked when they try to steal them. It's weird how he puts on a tie before shocking the neighborhood dogs. And that look in his eyes. . .
Everyone notices the tie! Next are reactions to expression. I'm thinking not CEO, Human Resources. Wonder if the domestic dogs learnt to jump while knocking over the can. Our dingoes easily learnt to leap over or between electric fences and when off the ground they don't get the hit. Whereas I have seen a billy goat continually knocked over due to some stubborn idea it wouldn't get him next time or he would win. I was working at a crystal water supplier & health regs naturally prevented stock entering near the factory. I switched off the electric fence to enable whipper snipping the fenceline when cattle/horses were contained in other paddocks. Some bright SPARK saw the off switch and put it on, zapping me. It happened a couple of times, despite my placement of signage, until I hid the plug under bibs & bobs in that out room. There is no fun in being zapped when the current is raised to exclude bulls. Had to google "whipper snipping". Thought it had to do with splicing or something. As I typed into the search box, it started raining google suggestions; "whipper snipping tips", whipper snipping while pregnant, whipper snipping techniques, in the rain, wet grass, weeds, calories burned. . .